If you look at the right hand side of the page you will see an icon for FoodBuzz. They are our Buds. I am a FoodBuzz Featured Publisher, which means they think I am cool and they send us fun things. 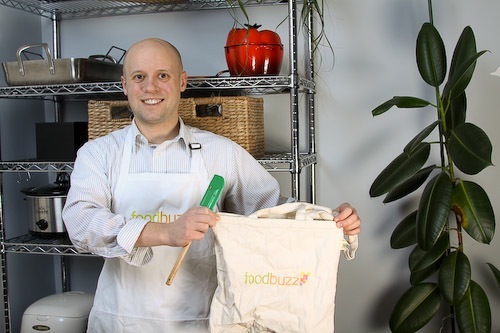 In return I have a FoodBuzz badge on Cookography because I think they are cool. FoodBuzz is an online social community of sorts for people who like food. There are recipes and restaurant reviews on their Web page. If you are a member of FoodBuzz, add Cookography as a friend. Right now we have 47 friends, which might be more than real life. FoodBuzz also pays us a small amount of money for the ad you see on the right hand side. It is not a ton, but it adds up! I was just able to get a new camera (a Canon 50D) thanks to this extra cash. I will post a review of the camera in a little from the point of view of a food blogger. FoodBuzz has also sent us a lot of cool things, and I thought it would be fun/dorky to get them all into one photo. So far I have gotten an apron, a silicon spatula and a canvas shopping bag. We love free things! So how are they, you ask? Well, the flavor names are REALLY long, but luckily they taste good. They are sort of like granola bars for adults. The banana one tastes really banana-y, but I love the Banana Bread flavored instant oatmeal so I am not complaining. They are a little bigger than standard bars, and come in at 140 calories. For me, that is the perfect size to fill me up as an afternoon snack. I don’t usually buy granola bars, but if I did, I think I would pick these up over a standard pack. They are a little more grown-up. You can get a free sample here. The other big question is if giving out free things to bloggers is a good marketing move. I love free things, so of course I like it. Since I am not a journalist, I am not really concerned with objectivity. At the same time I don’t really have to worry about ad-sales or catchy headlines. I am very lazy, so if I actually manage to post on something it is because I actually like or dislike the product. It will be interesting to see what happens with this trend. 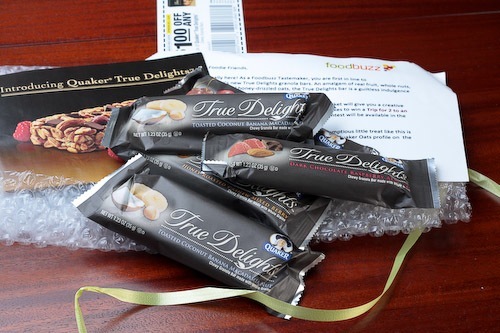 Thanks for trying the new True Delights granola bars and passing along the free sample info. We love to hear feedback and appreciate you sharing your opinion. my gosh we have so much in common: live in DC, part of Foodbuzz, and more importantly love free things! I received the same bars, but so far have only tried the banana one. I liked the big chunks of nuts in it, but not a huge fan of bananas. Nice! I always love meeting fellow DC bloggers. I think the Dark Chocolate bar was my favorite. They definitely went first! I’ve been a member of Foodbuzz also. I wished I received all these goodies. I just contact them. Great pictures. It took a while before they sent me anything, but it is always a fun surprise. You have some great photos on your site! I really have to do some more baking. Yea, I think it is a combination of that and the continued increase of ever more focused advertising. It is all cool with me as long as I get some free food. Of course people don’t want to read mini-commercials, so I won’t be doing this too often. This is going to be a brave new world for advertising though! PS – Grace is my sister and an advertising wiz.